A neat special-run addition to the SE range with oodles of retro flavour at a price that's extremely enticing. Retro makeover; USA Bigsby and locking tuners; playability and versatile tones. We would have preferred a roller bridge and coil-split humbuckers. The PRS Custom Semi-Hollow features a Rickenbacker-style soundhole in its maple top. PRS's high-quality enclosed locking tuners aid tuning stability. The bridge has similar string spacing to PRS's Stop-Tail wrapover bridge. PRS has a stuffed catalogue when it comes to its very successful Korean-made SE brand. The current range comprises a whopping 19 standard production models - surely that's enough? Well, not so fast, says the Maryland firm, and who can complain when this rather neat special run takes the standard SE Custom Semi-Hollow and adds a retro vibe via two sparkle finishes - a vibrant red and this cool all-black look - plus a USA-made Bigsby. "There's enough power to rock out: the bridge pickup's present but not overcooked treble response creates an articulate voice." The well-made chassis is nearly identical to the standard Custom Semi-Hollow. The mahogany back is hollowed out on the bass side then capped with a slab of maple sporting a Rickenbacker-style 'slash' soundhole. There's no flamed maple veneer, which tops the standard model and, unusually for PRS, we have clean, tidy white binding around the guitar's top edge, fingerboard and headstock. Another difference is the elongated, and again slightly Rickenbacker-esque scratchplate, which holds the quite cramped volume and tone controls with their Tele-like knurled metal knobs, and the three-way toggle switch. As ever, the wide-fat neck, with its 254mm (10-inch) radius fingerboard, tidily inlaid with old-style bird inlays, is smartly done. The medium jumbo frets, slightly lower in height than the USA models, sit over the edge binding and are mirror polished. The set-up is very tidy too. Along with the Bigsby we get a pretty standard-looking tune-o-matic bridge with near identical string spacing to the Custom Semi-Hollow's standard spec PRS-designed Stop-Tail wrapover bridge. And to aid tuning stability we have a set of PRS's rather fine top-locking tuners, as fitted to numerous USA-made PRS guitars. As supplied, tuning stability is pretty good. 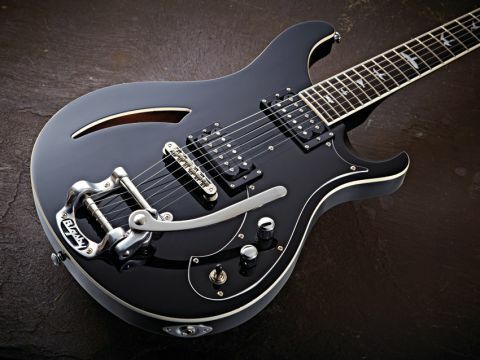 A Bigsby's travel is much more subtle than PRS's Strat-inspired vibrato but even so you need to take a little care. If you dump the arm fully down, the low E comes back sharp - one reason why many brands using Bigsbys today use friction-reducing roller-saddle bridges. Pickups are standard too: PRS-designed Korean-made SE open-coil humbuckers, with a master volume (and treble- bleed capacitor), master tone and that three-way toggle selector to regulate them. Neither pickup has an extra tap wire, so retro-fit coil-splits aren't possible. This is a shame, as Bigsbys and single-coils can be a match made in heaven. Comparing the guitar with an all-solid SE Bernie Marsden, there's less woodiness to the sound and a sense of air from the Bigsby. It seems to open out the mid-range a little, and although the semi-hollow construction isn't actually that hollow, it contributes a little to what is a characterful voice. There's enough power to rock out: the bridge pickup's present but not overcooked treble response creates an articulate voice. The darker and softer neck pickup is less distinct under gain, albeit in a usable, potentially lo-fi fashion, and that's sort of where the guitar takes us. Certainly with cleaner amp tones, some Bigbsy shimmer and the addition of heaps of reverb we're into Johnny Marr territory - back off the volume and tone a little and there's a slight hint of Gretsch-y, Rickenbacker tone, or more mellow and evocative jazz. Kick in a dirty fuzz tone and we're bang up-to-date. Sure, we'd have preferred to see a roller saddle bridge and some coil-splits, but the excellent locking tuners and USA-made Bigsby make up for most of that; like any Bigsby-equipped guitar you'll need to give it a little TLC to maximise tuning stability but then again that seat of your pants ride is part of the appeal, isn't it? This special run Custom Semi-Hollow is well priced (and likely to be much less on the street), plays well, sounds very good and looks it too. What more do you want?